All of a sudden, two layers of clothes are too many layers of clothes, and my toes are naked and touching the grass, and I’m drinking wine in parks and getting dirty looks from the other mothers for all my drinking wine in parks. 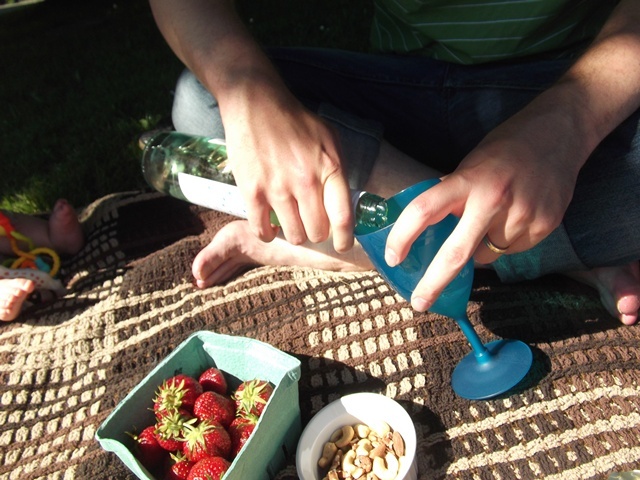 Summer finally landed in Vancouver yesterday, so picnic season began in earnest this afternoon. 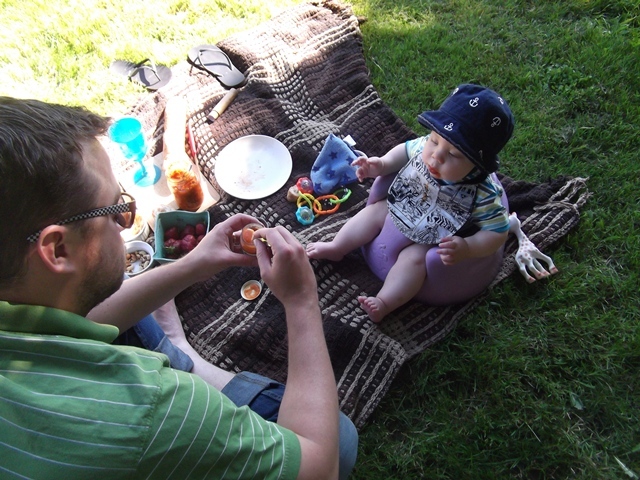 I have written about the joy of picnics here before but I am getting older and with age has come a tendency to repeat myself, and also to assume that what I say bears repeating. Take yourself on a picnic. Bring a friend, and a bottle of wine, and something to nibble on, and whittle away the afternoon, or just languorously pass your lunch hour (bottle of wine optional in that instance, unless you work from home). All you need is a patch of grass and a bit of bread and cheese. 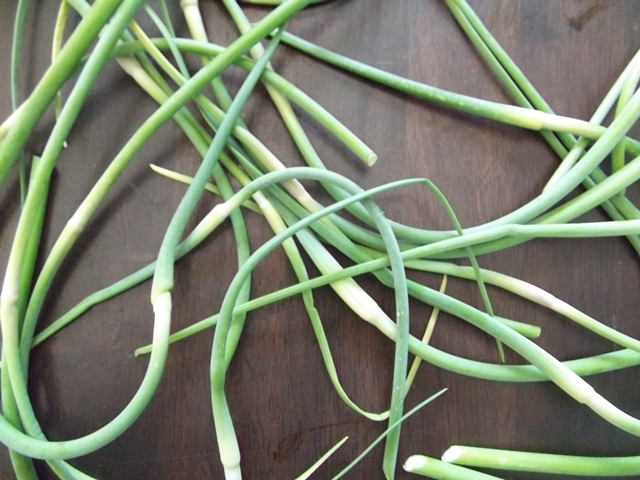 And garlic scapes, if you can find them. Even better if you can grow them. Wrap them in bacon, and eat them outside. Preheat your oven to 425°F. Lightly grease a rimmed baking sheet. Trim scapes at the bud, leaving eight to 10 inches of the stalk. (I left the buds on some of the shorter scapes, and the flowers inside were a little fluffy, but not unbearable if you’re used to finding cat hair in everything.) 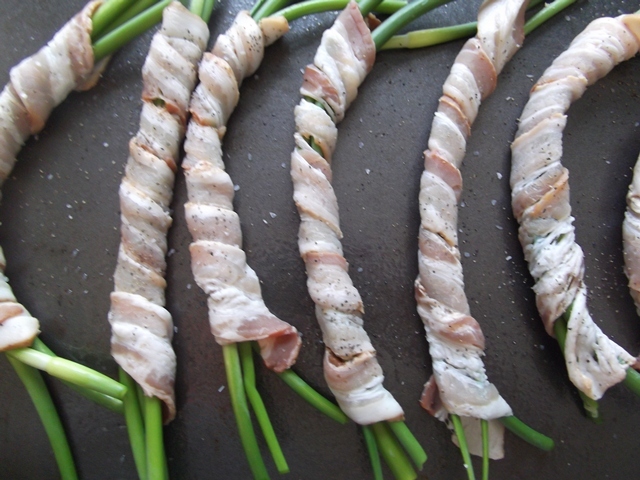 Bundle scapes in threes, wrapping each as tightly as possible with the bacon. 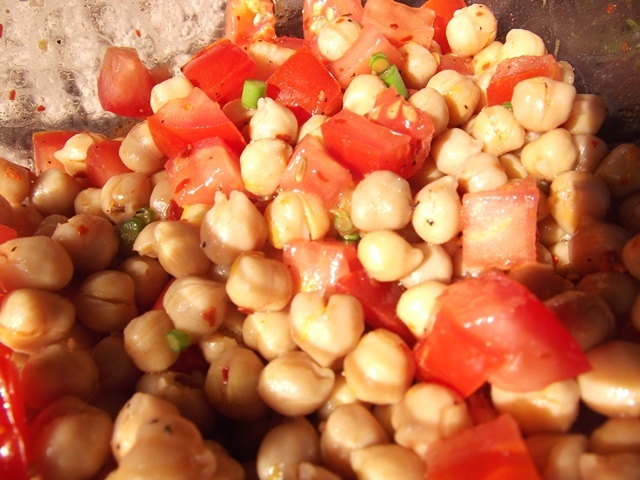 Sprinkle each bundle with a few flecks of coarse salt, then with freshly ground pepper. Bake for 25 minutes, until the bacon is brown and looks crisp. Flip the bundles halfway through. Delicious served hot, but also pretty nice eaten cold, in the shade, on the grass. < Previous Potatoes with chorizo, scallops, and gremolata. Next > Strawberry lemon pancakes. Um, bacon and garlic scapes? And some bread and cheese? Yes, please! It all looks ridiculously delicious, and I strongly agree with the picnic lifestyle, but I just have to comment on something altogether adjacent to this post. My mom allowed The Other Mothers to ruin her life up until I was probably 10. To this day (I am 30), the phrase makes me shudder. Don’t think for even a moment about pleasing the other mothers. You be you! 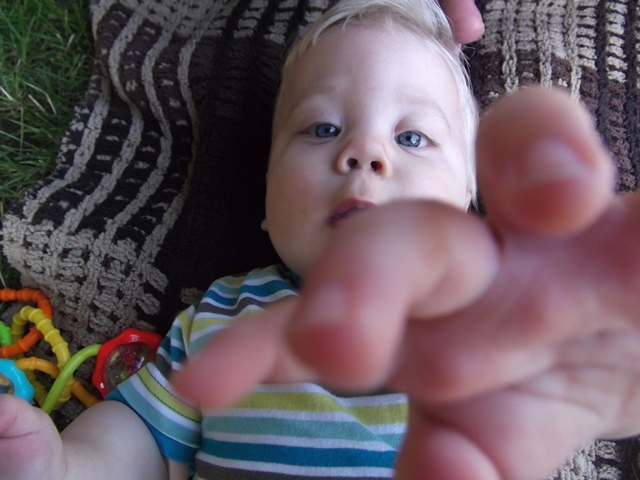 Let your kid be your kid! Even if he acts like a hellion in public or will not stand still to have his hair brushed for four days running or insists on wearing highly inappropriate clothes, such as tutus, to funerals. Even if you drink enough wine in public to pickle your appendix. Just don’t give them a thought. I don’t think you’re actually in danger of kowtowing to them, because you are awesome, but it’s something I feel quite passionate about. Ohhhh, the horror of The Other Mothers. For a picnic dessert, Grandma would make cake frosted with a thick layer of fudge and it would be warmed by the car trunk and sun and it was as if it just came from the stove. Yummy perfect! 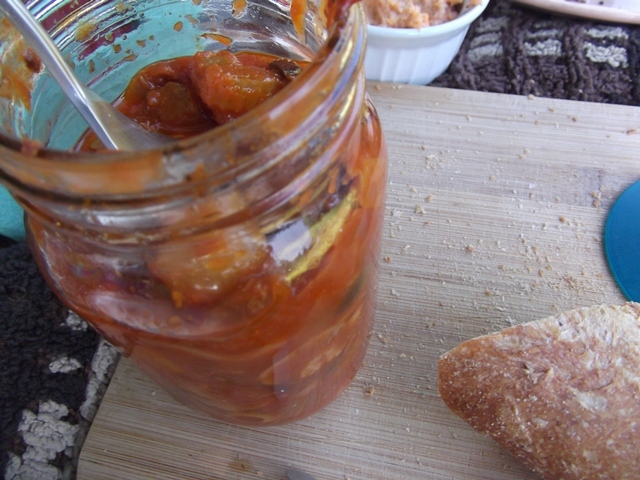 It’s nice to remember picnics that didn’t involve a quick take out box of chicken from the KFC. Dude, this post has crippled me. The food! The photos! Your baby in that hat and little squishy looking chair! 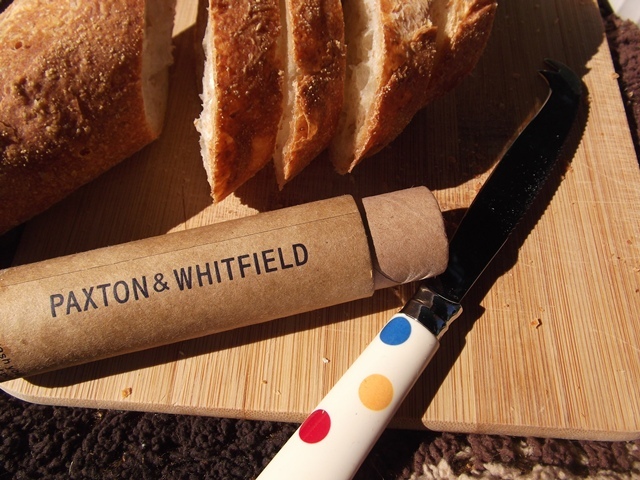 Thanks fornthe picnic inspiration. I agree; the bottle of wine is a must. I just hope those cops on Quads don’t find out. It is annoying how the Puritan anti-drinking attitude seems to apply once you’re a parent. Like you couldn’t possibly drink & parent at the same time. Portland’s got it right: Hopworks Urban Brewery/Pub has beer AND children’s activities. Oh man … as if I didn’t have enough reasons … I have to move to Portland! Oh glorious picnics! Always tops on my list! 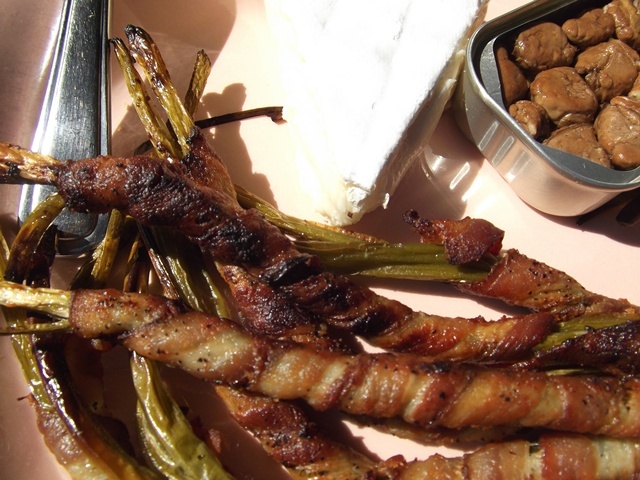 I found garlic scrapes last summer but never tried wrapping bacon around them! Next time for sure! 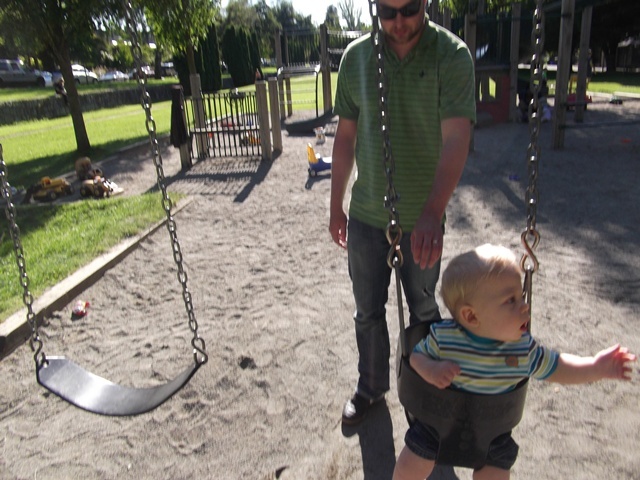 We were at a pub with Theresa in Perth that even had a sandbox for the kids to play in! The only trouble was the box-side seats risked a shower of sand in their drinks… good thing it mostly missed… Definitely an odd experience to have kids in pubs after growing up in Canada! Happy summer, Emily! I love the joy of this post. 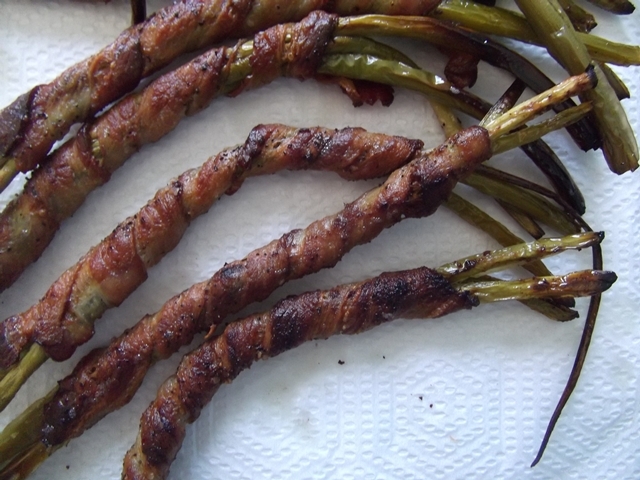 And the bacon-wrapped garlic scrapes: SWEET FANCY MOSES. I continue to marvel at your cooking. 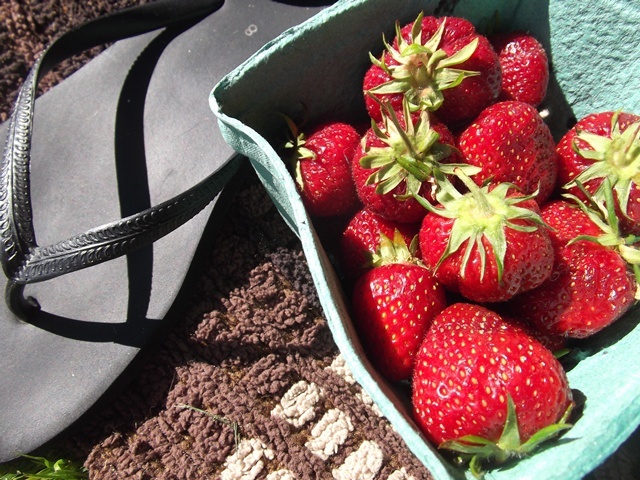 I went berry picking at a farm in Langley yesterday and was able to finally try the strawberries of this season. straight from the bush. You’re exactly right: they’re just the best. 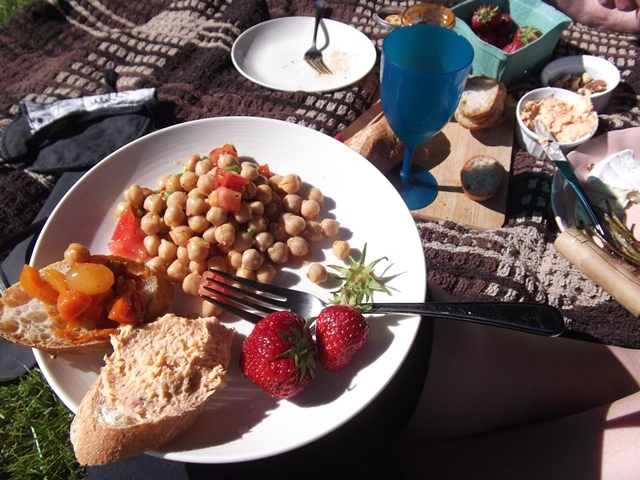 Here’s to many more picnics in the sun!